This is a Dutch name; the faimily name is Van der Vaart, nae Vaart. Van der Vaart at practice wi HSV in 2014. Rafael Ferdinand van der Vaart (Dutch pronunciation: [ˈraːfaːɛl vɑn dɛr ˈvaːrt] ( listen); born 11 Februar 1983) is a Dutch professional fitbawer wha plays for Dens club FC Midtjylland an the Netherlands naitional team as an attackin midfielder. ↑ "R. van der Vaart" (in Dutch). Voetbal International. Retrieved 8 June 2013. 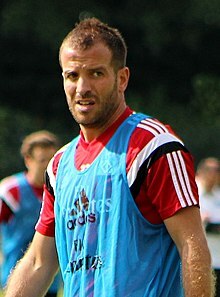 ↑ "Spielerprofil – Rafael van der Vaart" (in German). Hamburger SV. Retrieved 8 June 2013.